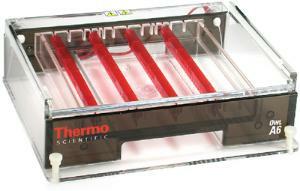 The 23Wx25Lcm (9x913/16") gel tray is supplied with gasketed end plates for leak-free gel casting without tape. Comb slot design allows the use of up to 10 combs spaced evenly along the tray for maximum sample capacity. Samples may be loaded directly from a 96- or 384-well plate, speeding loading time and reducing the chance of sample order error. System dimensions: 37.1Lx29.7Wx10.2Hcm (145/8x1111/16x4"). Ordering information: The system comes with buffer chamber, SuperSafe™ lid with attached power cords, UVT gel tray with gasketed end gates, two 25-tooth combs and two 50-tooth combs (1.5mm thick), and a three-point leveling base.